An Opinion On Sports: John Smoltz: Not A Brave? John Smoltz is no longer a member of the Atlanta Braves. John Smoltz will be pitching for the Boston Red Sox in 2009. Those two sentences just don't sound right. Smoltzy has always been a Brave. Always. I know his age, his ability to make his scheduled starts, and his injuries of just last year, have to be concerns for the Atlanta organization. But the Braves front office has struck out, no pun intended of course, on practically every big move they've tried to pull off this off-season. And this includes going after two or three 'big name' starters. It seems to me that failing to sign the starter(s) that you desperately needed would make re-signing Smoltz even more important to the Braves organization. His presence in the clubhouse alone is worth the difference in the Boston offer versus the Atlanta offer (which is reportedly around $2.5 million). 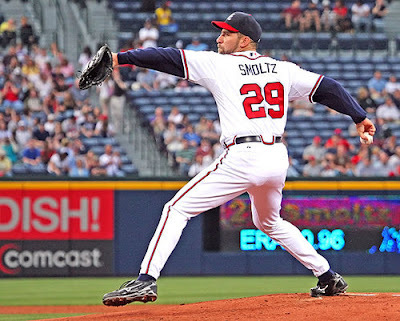 Like Chipper Jones stated, he's John Smoltz, he's earned that type of respect. You're rebuilding Atlanta. You've missed the playoffs for the past three years and you haven't been very competitive against the top two teams in the division, namely Philly and the Mets. You need those seasoned veterans like Chipper and Smoltz around. John Smoltz can still compete. Boston would never have signed him if he couldn't. You should never have let him go. Shame on you Atlanta.